Maricara Natural Area is home to old-growth forest, newer controversy and, possibly, some fairies. 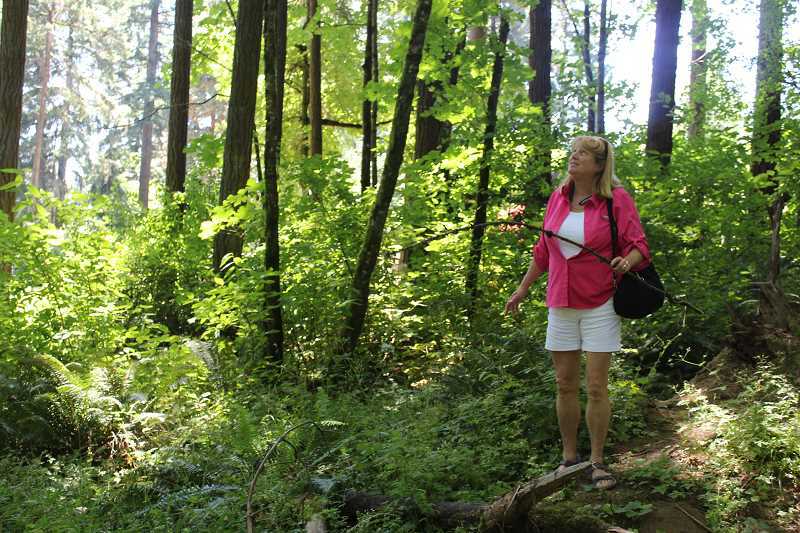 When walking into Maricara Natural Area, one exits Southwest Portland's suburban Markham neighborhood and enters a new ecosystem. Even on the sunniest, hottest summer day, a walker is instantly shrouded in cool shade, with wisps of smooth, dewy breeze rustling her hair. Old-growth trees tower overhead, their established roots winding their knotty tendrils across a wide swath of mossy ground. At around a quarter-mile long, Maricara's ancient woods serve as a reminder that we were not here first — something few city parks can accomplish. So when small, colorful fairy doors started cropping up in the nooks and crannies of Maricara's monumental arbors, it wasn't hard to imagine that they had been there all along. But Donna Herron knows that's not true. In fact, she says, the fairy doors only started taking root in the bases of trees (and, sometimes, high up in the branches) sometime in 2015. Herron is the president of the Markham Neighborhood Association, and she has been following what neighbors often refer to as a "controversy" surrounding the small wooden doors. Herron recalls seeing as many as 10 doors at their heyday, early in the summer of 2016. But a year later, when she walked through the park with diligent eyes peeled at the bases of trees and down offshoot paths, she only encountered one. "I am saddened I will not be able to walk my little granddaughter though Maricara and see the surprise on her face when she sees an actual fairy door similar to those in her bedtime story books," Herron said. In August of 2016, someone started taking the doors down. 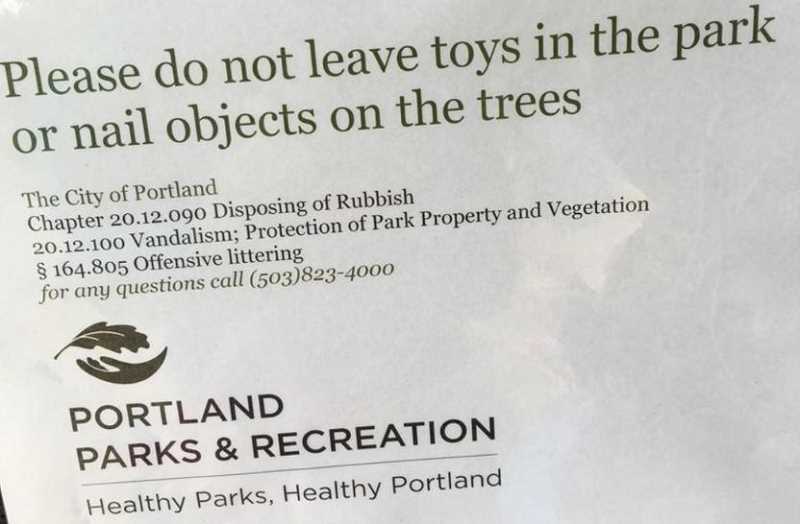 The identities of the installer and the remover are still unknown, but a note posted on the bulletin boards at both entrances to the natural area bore the logo of the Portland Parks & Recreation Department. "Please do not leave toys in the park or nail objects on the trees," the notes said. 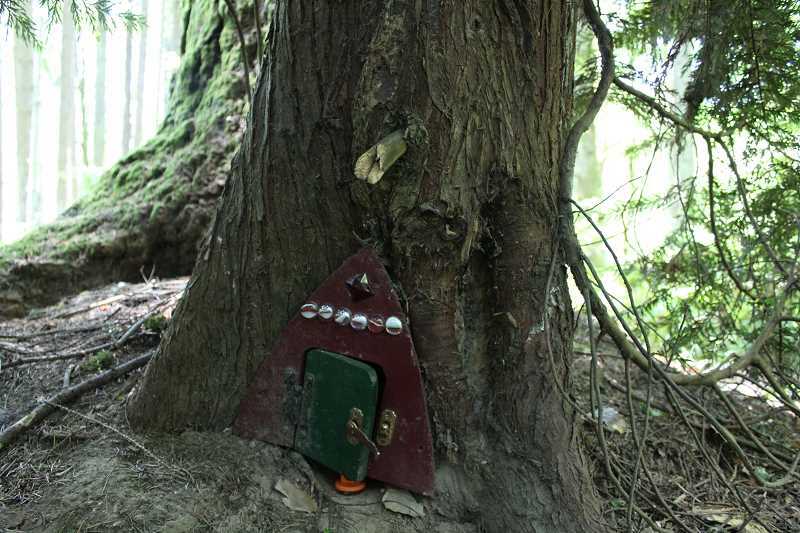 They also mentioned the specific City code violated by the fairy doors, and many residents took that to be an official park mandate that the doors would not be permitted. One local resident, Jodi Cullen, was so disturbed by Parks' decision to take the doors down that she wrote a letter to the department inquiring as to its motivations. "Maricara Park is a special little place in SW Portland," the letter began. "As you walk around the serene trail loop, you would find special little hand-crafted doors along the bottom of some of the trees. These doors were the homes of the Maricara Fairies. …With no notice whatsoever, a City employee came through and ripped off all the fairy doors. A few doors were too challenging to remove and, instead of completing the job, they chose to leave some of these lovingly handcrafted doors splintered in half and hanging in defeat. …What harm was being done? How dare you refer to this tradition that brings family and community together as 'Offensive Littering?'" Cullen's plea brought a surprising response by a representative of Parks, who insisted that no one from the department had written the notes or removed any doors. As one Parks employee told KATU after the TV station caught wind of the confusion, "It's impersonating your government is what it's doing." Cullen also appeared on KATU to tell her story. Soon after, she says, she received an anonymous note telling her in a threatening manner to stop talking about the doors. Eventually, Cullen told Herron, she had to move out of Markham, as she was afraid for her safety. Though the Parks Department eventually officially decided that there couldn't be any more new doors — Herron said officials were concerned because the park is in an environmental impact zone and the manner in which the doors were installed could damage the trees; plus, people were leaving plastic toys for the fairies at their doorsteps — the department said that the current doors can stay, Herron said. And now, nearly a year later, there's a ray of hope for keeping the fairy doors alive. Neighbors who own a small portion of the southeast corner of the Maricara woods tentatively agreed to have the doors transferred to trees on their property. Though they will eventually be selling to a developer who will tear down that portion of the woods, Herron thinks a small strip of the forest within the environmental zone will stay, along with the potential doors that nestle in trees in that zone. Until then, visitors will have to look for what may be the last remaining door Herron encountered on a recent July day, and ponder the mystery of the saga of the Maricara fairy doors. "We don't know who put them there and we don't know who takes them away," Herron said. "It's like a secret society."